In an effort to implement the science and engineering practices of the NGSS, I have tried to introduce argumentation as a practice into my chemistry courses. Typically, my general level students will complete a lab early in the year where they find the density of different samples of glass beads in order to determine the effect of sample size on density. To “NGSSify” this lab, students were given a guiding question and had to make a claim, support their claim with evidence and write a reasoning that links the evidence to the claim (CER). Guiding question: Does the density of glass beads, at a constant temperature and pressure change, from one sample size to another? The directions given to students were to have their group design a procedure to solve the research question above. Each group wrote out a step by step procedure for their investigation. The procedures were written out on write boards and then each group had a gallery walk to evaluate their classmates procedures while leaving one spokesperson at each group to answer questions and clarify any uncertainties. Students then met back with their groups and had the chance to modify their procedures based on the gallery walk. This was particularly helpful because some groups who had initially chosen one bead to be a sample, changed their sample size due to the uncertainty of one bead. The students then generated the density values for their samples. When grading the CER samples I was incredibly frustrated. This was not their first introduction to CER as they have had a previous year of science instruction utilizing the framework. Many students just copied their data table from their lab sheet in the evidence section and provided no other information. In the reasoning section, many students re-stated their density values and this proved the claim was correct or incorrect. I was extremely upset that my students lacked the ability to connect their mathematical calculations to the intensive properties of the beads. The argumentation session that followed was not great, many groups just talking about their numbers and the definition of density and simply just re-stating their claim and evidence. Overall, I just wasn’t happy with how the lab went. Sample CER whiteboard lacking justification. Earlier this month I attended the STANYS conference, the state conference for New York, and participated in an Argument Driven Inquiry workshop. While I have the ADI books it was helpful for me to see how I can better support my students in the argumentation process. The takeaway from the workshop was eye-opening. Firstly, students can absolutely put the data table in the evidence as well as explain their evidence. I was originally opposed to this because I thought it was lazy just to copy the data table and plop it in the evidence section, however it should be student generated. Moreover, where my students were putting summaries and explanations in the reasoning, ADI calls for data plus analysis and interpretation to go in the evidence section. In the evidence the analysis should be graphically displayed, followed by an interpretation to explain what the analysis means or is showing. Instead of using reasoning, ADI uses justification. In the justification section, students confirm what they did in their procedure and a rationale for why they did it in terms of greater science principles, thus explaining why the data collected is actual evidence to support this claim. It can be experiment independent and should include assumptions made. So in my case, procedurally how to find density and why did you collect the data you did to find the density. Additionally, what is density and what assumptions did we make in the lab. In the long run, it’s important for students to know why you are doing what you're doing and what data will that give you. I taught my students previously to start the reasoning section by writing the science principles related to the lab, so if this lab involves density, talk about density and then use your evidence to support your claim. Now, students can still think about the principles but maybe instead state something about what density is, what data you collect to find density and what that data means. Finally, ADI suggested the whole process requires reasoning so it’s understandable why students are confused what to put in that particular box about reasoning. This aligns with ideas shared by Dustin Williams in his blog titled "What is Reasoning?". I teach inclusion and general chemistry students and have always had students complain they don’t know what to write for the reasoning. I think giving the students a framework such as what did you do and why did you do it is at least a start at getting them to take their data and deductively determine how it supports the claim. I think if students can walk away from a lab knowing how to find data and understand what that data means, it may be more powerful to be able to extend that to multiple scenarios. 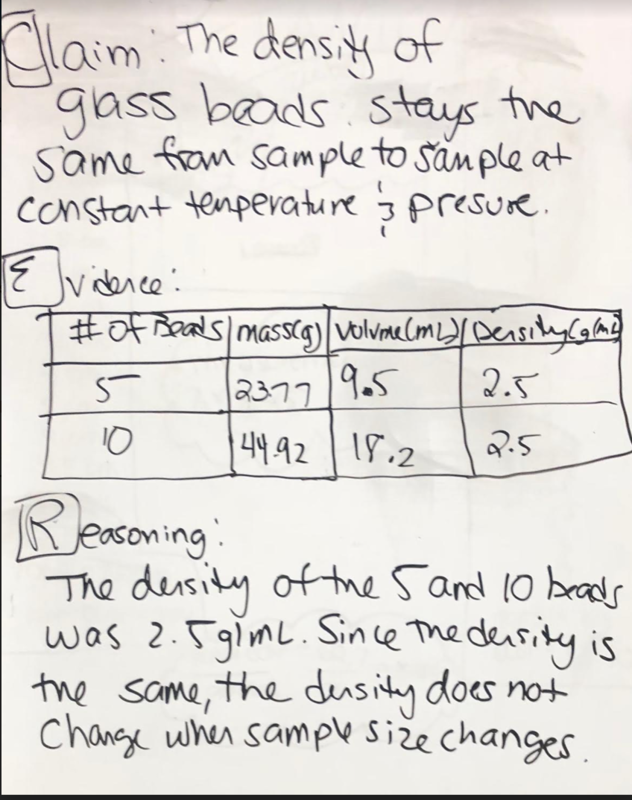 So in the density case, instead of my students stating the chemistry behind why the beads are the same (which I hadn’t taught yet as this was an inquiry lab), they justify what they did in the lab and what that means. It was not appropriate to be looking for students to explain atom arrangement when the lab provided no means for students to determine this. The major difference seems to be that the ADI framework includes the evidence and reasoning all in the evidence section and a justification as a stand alone section. I think some teachers have modified their CER framework to include justification and expansion of procedure and data collection of a greater scientific principle, but that was not part of the original CER framework which is why CEJ added it in. The Claim, Evidence, Reasoning (CER) or Claim, Evidence, Justification (CEJ) is a tool! The practice is what your students are doing, thus the practice of argumentation is happening throughout the process, whereas the CEJ or CER is a product for showcasing the learning that occurred. When students struggle more with what words go in which box, perhaps we drift too far off focus. The goal is scientific understanding and to learn how to create an argument to support your claim. For lower level students scaffolds are helpful to get kids where you want them to go. NSTA blog published a graphic organizer to scaffold student thinking and help students utilize transition words between thoughts. If you haven’t attended an ADI training I recommend trying to attend. ADI offers free monthly PD, face-to-face workshops as well as train the trainers workshops. There are also free rubrics available on the website to help evaluate your student arguments. You might also visit the ADI website to learn more about research supporting the idea. I have been using CER/ADI centered activities in my chemistry classroom for a few years and one of your takeaways was spot on: CER/ADI is a tool! It is absolutely a tool that helps students to look at the data they collect from a critical perspective and it helps them to organize their thinking. Not just what we saw, but what it means, and how it's related to what we have been studying, and how it applies to other situations. Additionally, it sounds as though you experienced much of what my colleagues and I experienced: helping students with their justifications is difficult and we, as teachers, have a learning curve in the process just like the students. I would highly recommend that people take the opportunity whenever it is available, to attend a workshop or seminar related to using CER/ADI in the science classroom. It is a process in which you become more fluent as you participate. Teachers should not lose faith in the process with one or more "unsuccessful" outings, rather, they should take heart in the process and improvements that they make; and with more practice comes more proficiency, and in this case, better teaching!